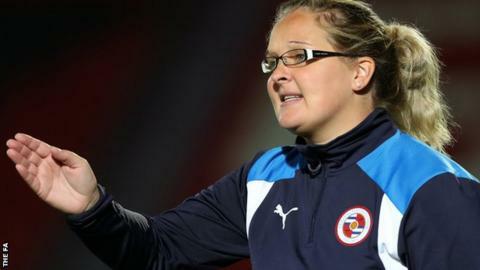 Reading FC Women's boss Kelly Chambers admits there were some "sleepless nights" over team selection in her first Women's Super League One season. Chambers steered the Royals to survival in the top tier despite winning just once all season. "I don't think our performances from start to finish this season warranted what we got in terms of results," Chambers told BBC Radio Berkshire. "The step up from WSL 2 to WSL 1 we've noticed has been massive." Chambers' busy season including giving birth to her daughter in July as well as combining the roles of first team manager and general manager at one stage of the campaign. "It's all new to me and it's been a learning curve during the season," Chambers said. "There have been sleepless nights at times picking teams. "But, securing WSL 1 status until 2018 is huge for the club. "For probably 95% of the squad, who haven't been involved in full-time professional football before, overnight they've had to transition and come out of full-time jobs. "One of my regrets this season is probably not doing more off-field stuff with the girls to teach them about life in professional football." Reading have already begun building for next season with the arrival of Netherlands captain Mandy van den Berg from Liverpool to strengthen their defence. "Mandy will add to our young squad in many different ways," Chambers added. "She will fit right in with our style of play, I'm looking forward to working with her". The hardest working woman in football? Read more on Is Reading's Kelly Chambers the most hard-working coach in the game?